We’d love your help. 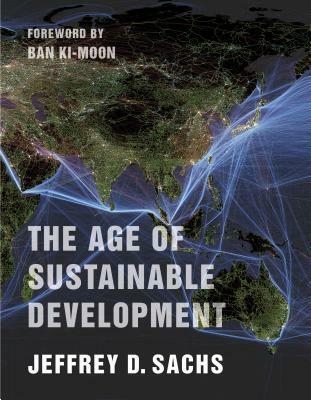 Let us know what’s wrong with this preview of The Age of Sustainable Development by Jeffrey D. Sachs. Jeffrey D. Sachs is one of the world's most perceptive and original analysts of global development. 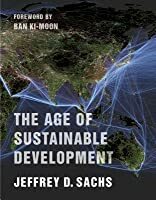 In this major new work he presents a compelling and practical framework for how global citizens can use a holistic way forward to address the seemingly intractable worldwide problems of persistent extreme poverty, environmental degradation, and political-economic injustice: Jeffrey D. Sachs is one of the world's most perceptive and original analysts of global development. In this major new work he presents a compelling and practical framework for how global citizens can use a holistic way forward to address the seemingly intractable worldwide problems of persistent extreme poverty, environmental degradation, and political-economic injustice: sustainable development. To ask other readers questions about The Age of Sustainable Development, please sign up. This is an essential book for any citizen that wants to understand present and future challenges for humanity. We live in an extremely critical moment, whatever happens in the next 20 years, whatever we as a species decide to do, will probably decide our survival. This book should be obligatory for last year school students. One of the strongest points of this great book is its panoramic overview and holistic approach to sustainable development. At the same time, this is also one of its main weaknesses: Trying to cover so much in just one book inevitably leads to lack of detail. The result: This book is a great but occasionally too basic introduction to sustainable development. But I am getting ahead of myself. First, some of what I think are the main points of the book. Our planet faces several existential threats t One of the strongest points of this great book is its panoramic overview and holistic approach to sustainable development. At the same time, this is also one of its main weaknesses: Trying to cover so much in just one book inevitably leads to lack of detail. The result: This book is a great but occasionally too basic introduction to sustainable development. Our planet faces several existential threats that are often interconnected. Achieving sustainable development, and solving problems such as climate change, extreme poverty, loss of biodiversity and inequality, will require complicated solutions and hard decisions. Therefore Jeffrey Sachs refreshingly urges us to embrace complexity and shy away from ''one size fits all'' solutions that supposedly can be applied in all circumstances to all countries. His criticism of such intellectually lazy solutions and the international organizations that have often proposed them is similar to Joseph Stiglitz' criticism of the IMF in ''Globalization and its discontents''. The last objective, good governance, is in fact a facilitator for the first three and applies not only to governments but also to businesses. - Endogenous growth: This is economic growth that ''comes from within''. It is most often caused by technological and social innovations, and the countries that experience this kind of growth tend to be the technological leaders. - Catch-up growth: This type of growth ''comes from the outside''. ''The technologies that fuel catch-up growth come from outside the economy engaged in rapid catching up. The essence of the strategy is to import technologies from abroad rather than to develop them at home'' (pag 80). Sachs describes endogenous growth using the theory of Kondratiev waves. Since Sachs seems to think that catch-up growth is more applicable to poor countries, his description of endogenous growth and the Kondratiev waves leaves the reader with many questions, mostly regarding how the Kondratiev waves work: Why do these waves last around 50 years? What causes their decline? This is one example where Sachs' book is lacking details. In ''Postcapitalism'', Paul Mason gives a more detailed description of Kondratiev waves. More importantly, Sachs seems to prefer catch-up growth for developing countries and doesn't ask how endogenous growth could be promoted in these countries. Only considering catch-up growth for poor countries may be an unnecessary limitation of the available solutions. An example of efforts to innovation in a country that is not a traditional technological leader is Start-up Chile (http://www.startupchile.org/). - Proximity to a technological leader: E.g. the first countries to follow England's example in the early days of the Industrial Revolution were its European neighbours. - Favourable agricultural conditions: High farm yields can free up labour for work in industry and services. - Energy resources: ''While it is possible to export goods and import primary energy in return (as South Korea and Japan do), it is generally very hard to get that process started in a place without any domestic low-cost sources of primary energy'' (pag 88). - A physical environment conducive to human health: A disease-ridden environment can be an obstacle to economic growth, for instance because investors may be afraid workers will be sick often. - Politics: Economic growth requires good governance, solid and inclusive institutions. Chaos, violence, corruption can seriously limit the potential for growth. 1. Poverty trap: A country may be too poor to make the basic investments to get out of poverty and get on the ladder of economic growth. 2. Bad economic policies: A country may have an honest government that unfortunately chooses wrong or inadequate policies, such as choosing central planning when a market economy would be better. 4. Geography: Adverse geographical conditions include: Being land-locked, high in the mountains, having endemic disease burden, vulnerability to natural disasters. 5. Poor governance: Signs of poor governance are extreme corruption, inefficiency and incompetence. 6. Cultural barriers: A frequent example is the discrimination against women and girls. Sachs recommends: ''For success in the twenty-first century, don't try to develop with only half of your citizenry, but take the lesson from a country that is mobilizing all of its citizens'' (pag 129) such as Rwanda, where women play an important part in politics. 7. Geopolitics: A country's political and security relations with its neighbours, foes and allies. So Sachs gives several explanations for why a country may be poor, and building on that he warns against ''a misguided desire for overly simplistic explanations of complex economic dynamics''. He goes on to return the criticism he received from Acemoglu and Robinson in their book ''Why nations fail'': ''In many places one will read that economic growth depends on 'economic freedom', or on 'inclusive institutions', or on 'controlling corruption'. Factors like economic freedom, political institutions. and corruption may play a role, but they certainly do not play the only role, or even the main role, in many places and times of history. These individual factors taken alone neither explain the pattern of development across the globe and over time, nor do they help us predict future development'' (pag 102). Despite these remarks and his insistence that poverty may have many causes, Sachs' explanation of choice for lack of economic growth seems to be geography. Geographical disadvantages can come in many forms: ''Being land-locked makes economic growth more difficult'' (page 32), because international trade is significantly more difficult for land-locked countries. ''Geography shapes many things about an economy, including the productivity of farms, the burden of infectious disease, the cost of trade, and the access to energy resources'' (pag 34). ''Small island economies can be quite vulnerable. They are subject to extreme climate catastrophes and often relatively isolated with high shipping costs to major ports'' (pag 48). ''There are still a few places where modern economic growth has not yet reached. These are generally places facing great geographical difficulties'' (pag 99). In ''A further look at geography'' ( pag 109-120), Sachs goes into more detail to make his case for geographical conditions as paramount determinants of economic development. 1. Extreme poverty: Are some people still exceedingly poor in the midst of plenty? 2. Inequality: Are the gaps between the rich and the poor very wide? 3. Social mobility: Can a poor person today hope to achieve economic success in the future? 4. Discrimination: Are some individuals such as women, racial minorities, religious minorities, or indigenous populations disadvantaged by their identity within a group? 5. Social cohesion: Is the society riven by distrust, animosity, cynicism, and the absence of a shared moral code? The importance of social inclusion is both obvious and empirically verifiable: ''More equal societies end up with greater intergenerational mobility'' (pag 271). Sachs points out that countries that are relatively equal in income distribution tend to have high social mobility (examples are Scandinavian countries), while ''the United States today, a country that once prided itself as the 'land of opportunity', but now is a society of high inequality and low social mobility'' (pag 267). Also, people tend to be happier in more equal societies, and democracy tends to function better in countries with a solid middle class. The third objective of sustainable development is environmental protection. This brings us to one of the main questions posed in this book: ''How to reconcile the continued growth of the world economy and the sustainability of the Earth's ecosystems and biodiversity?'' (pag 195). The answer is given just a few pages later: ''In order to reconcile the growth that we would like to see with the ecological realities of the planet Earth, we are going to need the world economy to develop in a fundamentally different way in the future'' (pag 199). Environmental sustainability is a very broad subject, and Sachs touches on many issues. I will focus on just 2 of those issues, which I think are among the most important: Green House Gas (GHG) emissions and population growth. GHG emissions, mostly CO2 and CH4, not only cause global warming, but also result in increased ocean acidification. One of the many insightful graphs in this book is 1.16 (pag 39), which shows the concentration of CO2 in the atmosphere during the last 800.000 years. The graph shows that for this entire period, the CO2 concentration varied between 180 and 280 parts per million (ppm). However, since 1800, CO2 concentration has broken away from that 800.000 years old bandwidth, and now stands at 400 ppm. We are well on our way to in heat up our planet into unknown and unpredictable new climates. The solution is as easy as it is urgent: A drastic reduction of GHG emissions is required. Sachs points out that we have crossed the point where only reducing GHG emissions is enough: We now need a double approach to both mitigate climate change and adapt to it, because some adverse effects of climate change are now inevitable. - Energy efficiency: Achieve much greater output per unit of energy input. E.g. much can be saved in heating, cooling and ventilation of buildings. - Decarbonization: Reduce the CO2 emissions. This involves dramatically increasing the amount of electricity generated by zero-emission energy such as wind, solar, geothermal and hydroelectric. - Fuel switching: Change from direct use of fossil fuels to electricity based on clean primary-energy sources. Population growth will have a major impact on all our efforts to achieve sustainable development. Figure 6.11 (pag 209) shows the scary scenario of business as usual: At current fertility rates, the world population will have ballooned to almost 30 billion by 2100. Vital resources such as water will become scarcer as the effects of climate change take hold, and those scarce resources will have to be divided among more and more people: a recipe for disaster. Reducing fertility rates seems crucial for keeping sustainable development manageable. - Ensure that girls are enabled to stay in school at least through high school diploma level, in order to discourage child marriages. - Invest in child survival. Convince each family that it is safe to have fewer children. - Make family planning and contraceptives available and free. - Encourage women to participate in the labour force. ''When women are working outside the home, the fertility rates are much lower'' (pag 213). - Funnily enough: Television! ''When television broadcasting arrives in a poor area, fertility rates come down, often quickly'' (pag 214). - Lack of intergenerational responsibilities. The externalities are on a global scale: ''High-income countries tend to have the largest GHG emissions per capita, while poor countries are often great victims of human-induced climate change without themselves having contributed much to the crisis'' (pag 394). One way to solve the issue of externalities is to make the polluters pay. ''CO2 imposes high costs on society (including future generations), but those who emit the CO2 do not pay for the social costs that they impose'' (pag 435). The most straightforward solution would be imposing a carbon tax. Other solutions include a permit system and feed-in tariffs. However, Sachs clearly prefers the carbon tax option. That top-down, government oriented approach does raise another question: Who will pay for it all? Massive investments will be needed to stop the vicious circle of disease and poverty. Sachs' most frequent solution is Official Development Assistance (ODA), basically financial aid and donations by developed countries. Will these countries always be willing to pay? Especially times of crises crisis, this is doubtful. Starting on page 301, Sachs offers 10 recommended steps to health for all. In most cases, these recommendations involve throwing money at the problem. Part of the solutions may require specifying where that money will come from. This is usually lacking in Sachs analysis. This book gives an impressive overview of was sustainable development is and what it can achieve. Sachs' focus on decent analysis, his embrace of complexity, acceptance of multiple causes of difficult issues and rejection of one-size fits all solutions are refreshing. His optimism is powerful (though occasionally over the top, for instance when he says on page 139 that there are a few remaining pockets of poverty, and on the same page indicates that 1.2 billion people live on US $ 1.25 per day. I would say 1.2 billion people are not a few remaining pockets of poverty). With its wide scope and holistic approach, this book is a great introduction to sustainable development. At the same time, this also the book's weakness: Covering so many topics in one book results in a sometimes too basic introduction. The result is that although it is wonderful to read through this holistic approach, on many occasions I couldn't help but notice that most of what I was reading was not surprising new knowledge to me. One thing I thought was lacking. The book ends with a description of the sustainable development goals (SDG). Also here there is a strong focus on a top-down approach. What I thought was missing was some suggestions what the average reader of this book, who has an ordinary day job, can do to contribute to the SDGs. Despite these small criticisms, the book is well worth the read. And perhaps on the last pages, quoting JFK, Sachs does give a suggestion of what you and I can do: Start by asking 'Why not'? The Age of Sustainable Development is the most comprehensive overview of humanity's greatest challenge - how mankind can exist in harmony with Earth's natural systems while solving the many severe problems facing humanity today, as defined by the United Nations' Sustainable Development Goals. Despite the immense challenge of achieving such goals in spite of a grossly unsustainable status quo, UN advisor and super-economist Jeffrey Sachs is dogmatically optimistic that humanity is capable of savi The Age of Sustainable Development is the most comprehensive overview of humanity's greatest challenge - how mankind can exist in harmony with Earth's natural systems while solving the many severe problems facing humanity today, as defined by the United Nations' Sustainable Development Goals. Despite the immense challenge of achieving such goals in spite of a grossly unsustainable status quo, UN advisor and super-economist Jeffrey Sachs is dogmatically optimistic that humanity is capable of saving our planet and ourselves if we collectively work towards doing so. This is the ultimate primer on Sustainable Development - Sachs explains the history of global development, the challenge of extreme poverty, planetary boundaries, food security, health issues, and so much more in neatly laid out sections with plenty of charts, photographs and real-life case studies that blend the economics and history with practical action and advice. As someone who has been heavily involved in addressing global health and development issues, Sachs offers tremendous insight into the successes and failures of various efforts to overcome developmental challenges. He is also utterly frank in humanity's devastation on the planetary systems, notably the rapid decline in global biodiversity, the realities of anthropogenic climate change, natural resource depletion, and more. It's a hard-hitting reality check on a plethora of challenges facing humanity which dispels many myths and misunderstandings surrounding these issues. I have but one question following the completion of The Age of Sustainable Development: Is sustainable development truly attainable under our current global economic system? Sachs seems to think so, claiming that continued (indefinite?) global economic growth can alleviate poverty and continuously improve well-being for both developed and developing nations, while simultaneously achieving environmental sustainability through efficient resource management, environmental regulation, and clean energy utilization (...while also adapting to and mitigating climate change through collective global efforts). The most important point to emphasize time and again is that the pressures of the global economy are so strong that even when treaties or regulations are put in place, vested interests often give a powerful counterforce to these measures, and control mechanisms are often at the mercy of illegal activities, bribery, corruption, and other limits of enforcement. The weight, force, and momentum of the world economy are often so powerful that the world economy runs roughshod over attempts at regulation. " Herein lies this exceptional book's overlooked barrier to sustainable development - the current global economic system of "development" itself. If humankind is to actually coexist within our planet's natural systems without damaging them beyond repair, alternative forms of socioeconomic structuring and developmental strategies need be explored in tandem with the many lessons and solutions presented by Sachs. I met the author today. this book address the global and humanitarian issues of today's world and showing pass ways and diagnoses of problems, this book whiteout simplification and correctly embracing complexity of the world, is also optimistic about the future and have hope in fate of humanity. but I met him today at a full Q&A after his lecture and I dare say, he was rather worried about the future and claimed age of Trumps might mislead us our roadmaps and goals of sustainable development s I met the author today. but I met him today at a full Q&A after his lecture and I dare say, he was rather worried about the future and claimed age of Trumps might mislead us our roadmaps and goals of sustainable development such as end of absolute poverty, agricultural revolution and so forth. This book is so informative, easy to digest and has an awesome amount of graphical content in it to supplement the reading. Definitely recommend reading. I would also highly recommend taking the supplemental online course (offered on coursera). There’s a great website and app interface, and the course is run by Jeffrey Sachs himself!! 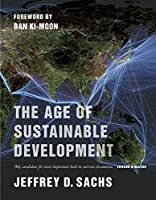 The Age of Sustainable Development, by Jeffery D. Sachs, is an ambitious book on the process of encouraging sustainable development as a tool to combat poverty, environmental degradation and rampant health issues, to name a few. This book encompasses many fields, including governance, health, development and environmental studies in Sachs quest to promote the field of sustainable development. For disclosures sake, Sachs is a key economic research analyst for current UN Secretary General Ban Ki-m The Age of Sustainable Development, by Jeffery D. Sachs, is an ambitious book on the process of encouraging sustainable development as a tool to combat poverty, environmental degradation and rampant health issues, to name a few. This book encompasses many fields, including governance, health, development and environmental studies in Sachs quest to promote the field of sustainable development. For disclosures sake, Sachs is a key economic research analyst for current UN Secretary General Ban Ki-moon, and sits on a number of boards dedicated to improving quality of health, and improving economic considerations worldwide. His interest in sustainable development ties in closely to the UN's Millennial Development Goals, and he proposes "Sustainable Development Goals" as a key alternative. Sustainable development in this book is a massive and complex web of different subjects (as can be seen from the tags I've placed on this book). It covers macro-economics in detail, touching on taxation rates, economic improvement for the third world, and the costs of energy sector development, to name a few. The book also covers health and wellness topics, such as access to drinking water, food, employment, education and healthcare, to name a few. The book also touches on governance issues, promoting transparency and public participation, but stopping short of criticizing authoritarianism as a system. Sachs basically says, "If it works, then it works." I really enjoyed this book. It is dense, to be sure, but highly readable, and full of interesting facts and figures, and a number of well thought out arguments on why sustainable development is important. Sachs takes an optimistic approach to environmentalism, which is very refreshing. He lays out many of the challenges we face as a global community in detail (graphic or otherwise) but offers potential solutions to each one. He stays away from the "Private/Public" debate on funding and proper taxation, and instead states that it doesn't matter, as long as funding exists for key infrastructure projects. I could go on an on. Really, this is an excellent and critical read on sustainable development as a way forward into the future. It is an important book, that gathers many of the key problems facing human civilization and offers solutions to them that are cost effective and realistic. Rome wasn't built in a day, and neither will proper sustainable development targets, but with people like Sachs at the helm, the future does begin to look a whole lot brighter. Jeffrey Sachs basically expands on the Millennium Development Goals (MDGs) by explaining the Sustainable Development Goals (SDGs) to address what he calls extreme poverty, environmental degradation, and political-economic injustice worldwide. He provides valuable information throughout the book and some insightful solutions to address these issues, such as adaptation by communities to prepare for current and future social, economic, and environmental issues. However, as was the case with the MDG Jeffrey Sachs basically expands on the Millennium Development Goals (MDGs) by explaining the Sustainable Development Goals (SDGs) to address what he calls extreme poverty, environmental degradation, and political-economic injustice worldwide. He provides valuable information throughout the book and some insightful solutions to address these issues, such as adaptation by communities to prepare for current and future social, economic, and environmental issues. However, as was the case with the MDGs, much of the focus is on governments solving these problems because there is an assumption that the free market fails to internalize the social cost, fails from asymmetric information, and fails from other reasons leading to the necessity of government intervention. Meanwhile, Sachs doesn't consider the poor choices made by government (public choice) and potential opportunity costs that are often substantially worse than outcomes in the private market. There are key issues addressed in this book and some good ideas included in the SDGs, but it is too close to central planning for my taste and unlikely to resolve the major issues of our times as we live in a dynamic world where policymakers are often, if not always, behind the curve. However, works such as this might help us get closer to better understanding big social and economic issues and find ways to address them. Overall, the book is rather repetitive and the recommended actions are based on many assumptions that aren't necessarily supported by data or research. In addition, the public policy choices are based on the precautionary principle that can be very costly. For example, there is much discussion about getting the world off of fossil fuels (i.e. oil, natural gas, coal, etc.) as a source of energy but there is little to no discussion about the benefits of greening the earth and substantial improvements in well-being from fossil fuels and more greenhouse gases. So, if the world is to get off of fossil fuels and the potential gains from doing so, we must consider the large losses in economic activity and human improvement that would have happened over time. This is a common mistake in much of the environmental research as they focus on the social cost of carbon that's dependent on the discount rate and ridiculous assumptions in large-scale models but dismiss the social benefit of carbon. Outstanding information and very readable format encompassing a very wide breadth of information and disciplines. This comprehensive review of the planets health as a function of metrics that essentially capture all phases of one's quality of life from education to deforestation, biodiversity, and social mobility as examples. The author is an outstanding writer supported by superior graphics illustrating each subject area with the result being an entertaining education regarding absolutely criti Outstanding information and very readable format encompassing a very wide breadth of information and disciplines. This comprehensive review of the planets health as a function of metrics that essentially capture all phases of one's quality of life from education to deforestation, biodiversity, and social mobility as examples. The author is an outstanding writer supported by superior graphics illustrating each subject area with the result being an entertaining education regarding absolutely critical subjects impacting our lives. You can debate the solutions proposed, but the evidence supporting the reality we face as a species is incontrovertible. If you want a thorough introduction to the causes of world poverty and underdevelopment this is it, More surprisingly perhaps, it is also the place to find an optimistic view of how that poverty can be overcome in a way that enables further economic progress for everyone, Progress achieved in a way that respects planetary boundaries and starts to reverse the climate damage we have already instigated. It's not rocket science. It's pretty straightforward. We know how to do it. With people like Pro If you want a thorough introduction to the causes of world poverty and underdevelopment this is it, More surprisingly perhaps, it is also the place to find an optimistic view of how that poverty can be overcome in a way that enables further economic progress for everyone, Progress achieved in a way that respects planetary boundaries and starts to reverse the climate damage we have already instigated. What an important book! I greatly enjoyed the way Mr. Sachs ties together ideas from multiple disciplines: economics, politics, natural and human sciences, cultural studies... both providing factual background and envisioning solutions for the great challenges of humanity. A good friend who recommended this book to me said: "This book should be obligatory for last year school students". I couldn't agree more. Highly recommended to everyone, no exceptions. I approached The Age of Sustainable Development with a fair amount of skepticism but Sachs won me over with his lucid writing and comprehensive view of the daunting challenges ahead. Thankfully, Sachs is not a doomer but approaches what we must do with a realistic analysis of what it will take to avert global catastrophe. Difficult, yes; impossible, no. We have no choice but to try. Loved the book, but the content is very similar to the MOOC that was offered with the same name. I liked the book. The author presented wide range of problems the current society is facing. Among the core ones are Extreme Poverty, Social Inclusion and Sustainable Economic Growth. The book has two distinguishable parts. The first part focuses more on the problems and explanation of what is percevied as the problem as well as what was and wasn't done in the last decades (Millenium Development Goals - Fighting Extreme Poverty in Developing countries). The second part is about the potential app I liked the book. The author presented wide range of problems the current society is facing. Among the core ones are Extreme Poverty, Social Inclusion and Sustainable Economic Growth. The book has two distinguishable parts. The first part focuses more on the problems and explanation of what is percevied as the problem as well as what was and wasn't done in the last decades (Millenium Development Goals - Fighting Extreme Poverty in Developing countries). The second part is about the potential approaches that could be used to solve current issues in different parts of the world (Sustainable Development Goals and their implementation). What I liked most was the holistic approach to the topics. More or less throughout the whole book, the concept and ideas from one or more fields were connected to other fields. As an example the fertility rate highly decreases without any external stimulus if the women get higher education, the child birth rate decreases and the availability of contraception increases. This book is great! Jeffrey D. Sachs is a great teacher and also one of the greatest economists worldwide! This book talks about how the world would become a better place for everyone. Our planet is not sustainable, there is growing income inequality, social exclusion and jobless for youth+ Environmental Crises. Sustainable Development is the Holistic Integration of Economic, Social, and Environmental Objectives in an Approach to Scientific Analysis, Governance, Problem Solving, and Human Action This book is great! Jeffrey D. Sachs is a great teacher and also one of the greatest economists worldwide! This book talks about how the world would become a better place for everyone. Our planet is not sustainable, there is growing income inequality, social exclusion and jobless for youth+ Environmental Crises. Sustainable Development is the Holistic Integration of Economic, Social, and Environmental Objectives in an Approach to Scientific Analysis, Governance, Problem Solving, and Human Action. This book is an opened mind and even if you are not expert at the subject, you will understand. Read this book as part of a Columbia University / Coursera online course. Excellent survey of all aspects of sustainable development, including energy, climate change, food safety, health, urban development, and more. My only compliant -- not that it's really Sachs's fault -- is that, despite his apparently boundless optimism for humanity's ability to save itself from certain doom, the facts show through. No more clear is this in the election of a US Senate, House of Representatives, and Preside Read this book as part of a Columbia University / Coursera online course. Excellent survey of all aspects of sustainable development, including energy, climate change, food safety, health, urban development, and more. My only compliant -- not that it's really Sachs's fault -- is that, despite his apparently boundless optimism for humanity's ability to save itself from certain doom, the facts show through. No more clear is this in the election of a US Senate, House of Representatives, and President who are neolithic dinosaurs set to eradicate every tentative step the United States has taken towards becoming a sustainable society, and throw us back to the stone age. Were that we could also have the atmospheric CO2 levels associated with regressing thousands of years. Overall, the book is quite thorough in looking at sustainable development from an economist's point of view. However, noted that the millennial project directed by the author was a failure, prompting the optimists to consider the practicality and reality when it comes to a so-called sustainable development. I can't recommend this book more highly if you're interested in understanding the interconnections between the economy, education, health, equality, and the environment on a global scale. Sachs is a fantastic teacher - his arguments are science-based and he is honest about the enormous challenges ahead, while also presenting potential solutions and process to address them. This book makes “changing the world” directional and attainable. Some parts are repetitive but overall it is extremely well structured. This sets an excellent foundation for deeper research in development. It’s really amazing, emotional at times. Eye-opening to this age’s most urgent global problems and some solutions that have worked before. Sometimes grim, sometimes uplifting, but definitely vital for us to know its content. Finally finished! My mind is now a treasure trove for anything related to sustainable development. Un gran libro para iniciarse en la temática del desarrollo sostenible. El autor es un pionero en el tema y consultor de gobiernos y de ONU. This is a very interesting book. You will discover or revisit many topics that really matter for our future. This is an easy read although the book has close to 500 pages. Great read, easy to follow very captivating and actually positive about the future, made a change the usual negative world ending environmental texts. Basically the foundations of sustainable development, its concept and its application. It can be read both all at once or as a study manual. Jeffrey David Sachs, is an American economist, public policy analyst, and former director of the Earth Institute at Columbia University, where he holds the title of University Professor, the highest rank Columbia bestows on its faculty. He is known as one of the world's leading experts on economic development and the fight against poverty. Sachs is the Quetelet Professor of Sustainable Development Jeffrey David Sachs, is an American economist, public policy analyst, and former director of the Earth Institute at Columbia University, where he holds the title of University Professor, the highest rank Columbia bestows on its faculty. He is known as one of the world's leading experts on economic development and the fight against poverty. Sachs is the Quetelet Professor of Sustainable Development at Columbia's School of International and Public Affairs and a professor of health policy and management at Columbia's School of Public Health. As of 2017, he serves as special adviser to the United Nations (UN) Secretary-General António Guterres on the Sustainable Development Goals (SDGs), a set of 17 global goals adopted at a UN summit meeting in September 2015. He held the same position under the previous UN Secretary-General Ban Ki-Moon and prior to 2016 a similar advisory position related to the earlier Millennium Development Goals (MDGs), eight internationally sanctioned objectives to reduce extreme poverty, hunger and disease by the year 2015. In connection with the MDGs, he had first been appointed special adviser to the UN Secretary-General in 2002 during the term of Kofi Annan.